Beaphar UK has announced the UK winner of their recent global competition #DrawMeYourFamily. George Rocke, age 6, from Hereford has been chosen as the winner, and will receive the fantastic prize of a family adventure break worth £1000. Dr Sue Huggett, UK Business Manager, Beaphar UK, said: “We were so impressed by all the entrants to our #DrawMeYourFamily competition, and would like to thank all our retailers for getting behind it. The competition has really helped strengthen the relationship Beaphar has with our consumers, and we are confident our trade customers will see this in their sales too. 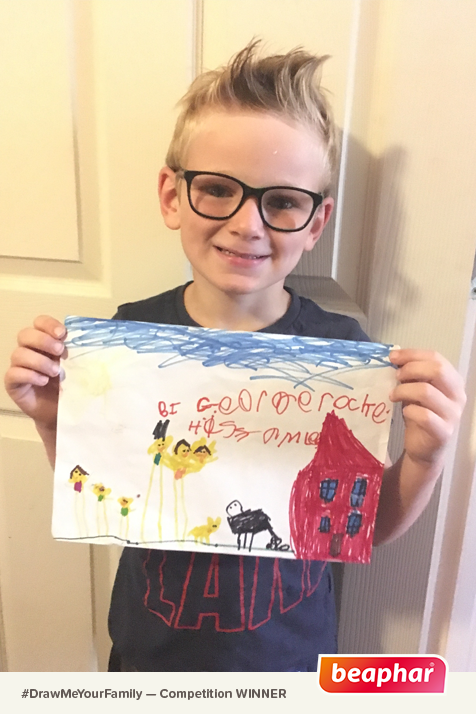 “George’s picture was one that stood out, and having learnt a little more about his family we are thrilled to have been able to give them a such an amazing prize. It is clear from all the entries we received that children really do view their pets as part of the family. Beaphar UK offers continuous product support to their trade customers all year round, including training, in-store point-of-sale and digital assets. For more information, please contact your local Sales Executive, call our award-winning Customer Service Team on 0333 0066236 or email info@uk.beaphar.com.